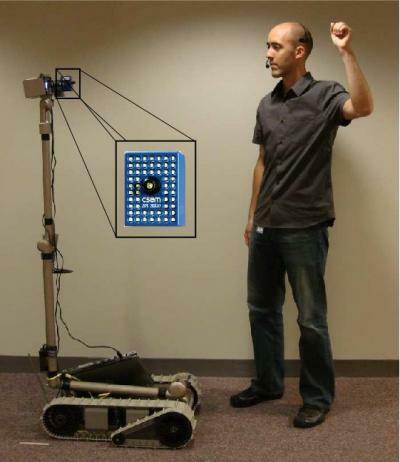 A robot able to accept gesture commands was announced by Brown University researchers. The group demonstrated that structured light-based depth sensing with standard perception algorithms can enable mobile peer-to-peer interaction between humans and robots. 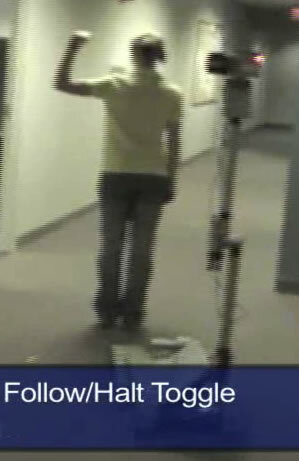 The gesture-command robot is based on iRobot's Packbot. iRobot also participated in funding along with DARPA. Other contributors to the research include Matthew Loper, a Brown graduate student and lead author on the paper announcing the research. Contributors include former Brown graduate student Nathan Koenig, now at the University of Southern California; former Brown graduate student Sonia Chernova; and Chris Jones, a researcher with the Massachusetts-based robotics maker iRobot Corp. The researchers made two key advances with their robot. The first involved what scientists call visual recognition. Applied to robots, it means helping them to orient themselves with respect to the objects in a room. "Robots can see things," Jenkins explained, "but recognition remains a challenge." The team overcame this obstacle by creating a computer program, whereby the robot recognized a human by extracting a silhouette, as if a person were a virtual cutout. This allowed the robot to home in on the human and receive commands without being distracted by other objects in the space. "It's really being able to say, 'That's a person I'm looking at, I'm going to follow that person,'" Jenkins said. The second advance involved the depth-imaging camera. The team used a CSEM Swiss Ranger, which uses infrared light to detect objects and to establish distances between the camera and the target object, and, just as important, to measure the distance between the camera and any other objects in the area. The distinction is key, Jenkins explained, because it enabled the Brown robot to stay locked in on the human commander, which was essential to maintaining a set distance while following the person. Douglas Adams wrote about the idea of a gesture-controlled system in his 1979 blockbuster The Hitchhiker's Guide to the Galaxy. He also illustrated some potential problems with such a system. I'd like to see this gesture control interface added onto the feature set of DARPA's BigDog robot; take a look at this recent BigDog video below. Obviously the perfect companion for the Brown research robot; somebody needs to get these two bots together. JVC demonstrated a handclap and gesture recognition TT, apparently unaware that American "clapper" technology leads the world. Via Eurekalert. You can also download a video from their website at Brown; see Mobile Human-Robot Teaming Enabled by Depth-Imaging .